Milwaukee<sup></sup> M12 Heated Jacket: Redesigned for optimal fit and better heat retention, Milwaukee<sup></sup> M12 Cordless Heated Jackets integrate (5) carbon fiber heating elements and advanced fabric-layering technology to distribute and maintain heat across core body areas. For added versatility, two distinct heat zones (back and chest, lower pockets) can be adjusted independently to provide the right amount of heat for any situation. A rugged wind and water resistant shell keeps weather out while improved insulation and a thermal fleece lining hold heat in to maximize warmth and reduce the number of layers needed. On and off the jobsite, Milwaukee<sup></sup> M12 Heated Jackets provide up to 6 hours of continuous heat per battery charge to withstand even the harshest winter conditions. Milwaukee<sup></sup> M12 Heated Jacket utilizes the same M12 REDLITHIUM Battery technology that powers 60+ tools. All M12 Heated Jackets are washer and dryer safe. Powered by M12 REDLITHIUM Battery Technology, the Milwaukee<sup></sup> M12 3in1 Heated Jacket combines technology and toughness to redefine layering on the jobsite. Pairing a heated hoodie with a heavy duty wind/water resistant outer shell provides ultimate warmth, versatility, and durability. The inner layer uses carbon fibre heating elements to create and distribute heat to the chest and back. Both pieces utilize GridIron 900 Denier Ripstop Polyester in high wear areas to Outlast 12oz cotton duck workwear by 3X against abrasion and tearing. Also featuring tarnish resistant metal zippers, and riveted, reinforced storage pockets the 3in1 Heated Jacket is built to survive jobsite conditions in any weather. Powered by the revolutionary M12 REDLITHIUM battery, the M12 Cordless LITHIUM-ION Realtree AP Heated Jacket delivers comfort and heat in cold weather conditions. This multi-layered camouflage jacket utilizes new cold weather technology to actively warm the body and stimulate blood circulation. Three carbon fiber heating zones distribute heat to core body areas, with a stylish performance-fit that gives users maximum flexibility and comfort during use. The 2332 M12 Realtree AP Heated Jacket features three heat settings for varying heat needs, and is water and wind resistant for a variety of weather conditions. Ideal for cold weather activities, this camo heated Jacket delivers continuous heat for up to 6 hours per battery charge. Powered by the revolutionary M12 REDLITHIUM battery, the M12 Cordless LITHIUM-ION Red Premium Heated Jacket delivers comfort and heat in cold weather conditions. This jacket utilizes new cold weather technology to actively warm the body and stimulate blood circulation. Three carbon fiber heating zones distribute heat to core body areas, with a stylish performance-fit that gives users maximum flexibility and comfort during use. 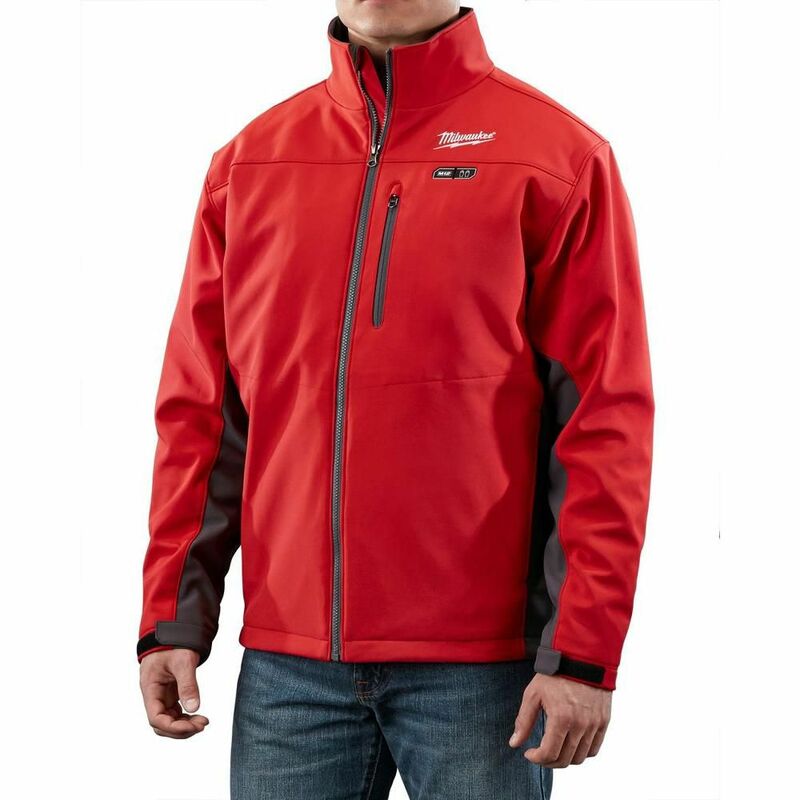 The 2341 M12 Red Premium Heated Jacket features three heat settings for varying heat needs, and is water and wind resistant for a variety of weather conditions. Available in sizes ranging from S - 3XL. Battery and charger included. The large red heated TOUGHSHELL jacket is powered by the M12 REDLITHIUM battery. The heated jacket's carbon fiber heating elements create and distribute heat to the chest, back and front hand pockets. A single touch LED controller heats up the battery heated jacket to three heat settings. The MILWAUKEE heated jacket kit's Quick-Heat funtion heats up three times faster than previous jackets and market competitors. The TOUGHSHELL stretch polyester jacket mateiral delivers five times longer jacket life than previous MILWAUKEE softshell heated jackets. The durable material also provides wind and water resistance to survive the elements whether on the worksite or enjoying the outdoors. M12 Cordless Red Heated Jacket Only - M Milwaukee<sup></sup> M12 Heated Jacket: Redesigned for optimal fit and better heat retention, Milwaukee<sup></sup> M12 Cordless Heated Jackets integrate (5) carbon fiber heating elements and advanced fabric-layering technology to distribute and maintain heat across core body areas. For added versatility, two distinct heat zones (back and chest, lower pockets) can be adjusted independently to provide the right amount of heat for any situation. A rugged wind and water resistant shell keeps weather out while improved insulation and a thermal fleece lining hold heat in to maximize warmth and reduce the number of layers needed. On and off the jobsite, Milwaukee<sup></sup> M12 Heated Jackets provide up to 6 hours of continuous heat per battery charge to withstand even the harshest winter conditions. Milwaukee<sup></sup> M12 Heated Jacket utilizes the same M12 REDLITHIUM Battery technology that powers 60+ tools. All M12 Heated Jackets are washer and dryer safe.